Cooper Aerobics History starts in 1964, when preventive medicine pioneer Dr. Kenneth H. Cooper, developed the 12-minute and 1.5-mile fitness tests and the Aerobics Point System while in the U.S. Air Force working with NASA. Follow Dr. Cooper over more than four decades in this Cooper Aerobics history. Started in 1970, the Cooper Center Longitudinal Study (CCLS) – managed by The Cooper Institute – now houses 1.8 million person years of data collected by recording treadmill stress test results of more than 110,000 Cooper Clinic patients. 1968: The best seller book Aerobics is published. 1970: The Cooper Institute, a nonprofit dedicated to research the benefits of aerobic exercise is established in June. In December, Cooper Clinic opens. 1982: To improve school physical education programs, FitnessGram, a student fitness report card, begins. 1986: Dr. Kenneth Cooper definition of “aerobics” is added to The Oxford English Dictionary. 1989: The Journal of the American Medical Association publishes The Cooper Institute’s research proving being fit, as measured by the treadmill stress test, decreases the risk for all-cause mortality by 58 percent. 1995: Son Dr. Tyler Cooper, MD, MPH, joins the Cooper Aerobics staff and spearheads corporate wellness consulting. 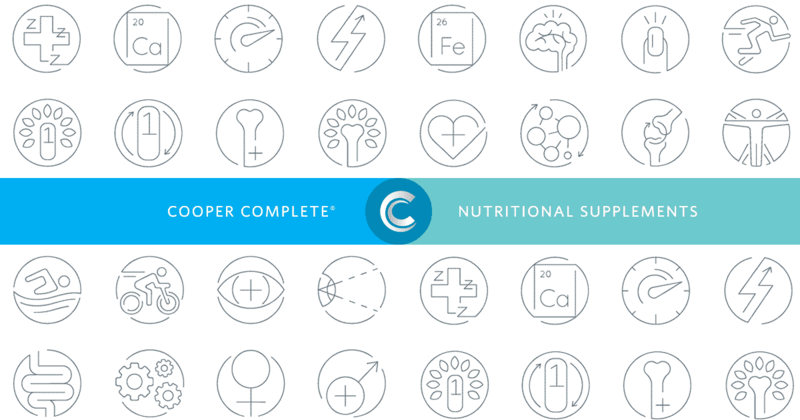 1998: The physician-formulated Cooper Complete nutritional supplement line launches. 2002: Dr. Kenneth H. Cooper works with PepsiCo to eliminate trans fats from Frito-Lay snacks. 2012: Dr. Tyler Cooper is named board president of the Dallas Division of the American Heart Association. 2012: Research from The Cooper Institute and UT Southwestern Medical Center finds middle aged fit adults have fewer chronic diseases and health complications as seniors. 2013: The Cooper Institute publishes an important paper in the Annals of Internal Medicine reporting fit individuals are 36 percent less likely to develop Alzheimer’s disease in later life as compared to unfit individuals. Article provided by Cooper Complete team. We enjoy answering your questions about Cooper Complete Supplements. Below are the 10 most commonly asked questions about our vitamins and supplements. Get Cooperized. It’s a phrase you may have seen and heard by now. So, where did we come up with this tagline and what does it mean? We’re so glad you asked.